RESEARCH TRIANGLE PARK, NC--(Marketwired - September 11, 2017) - New analysis of more than a dozen life science firms revealed that the highest percentage of surveyed global teams -- 91% -- involve lab animal science subgroups in their preclinical structures, according to business intelligence provider Cutting Edge Information. 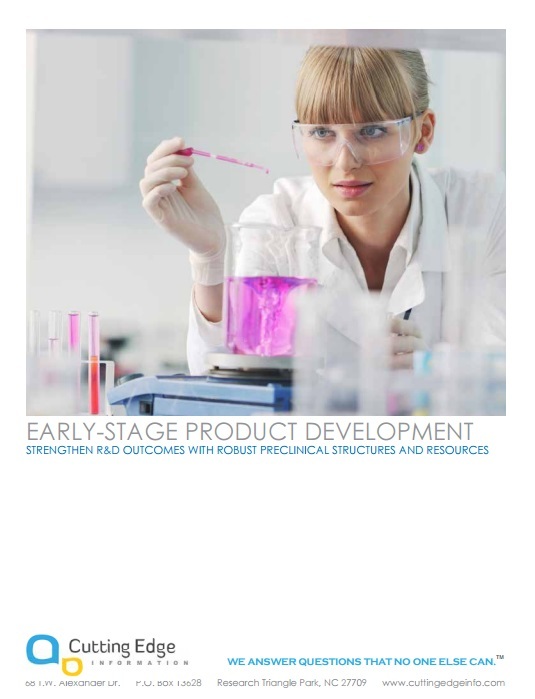 The study, Early-Stage Product Development: Strengthen Research and Development Outcomes with Robust Structures and Resources, found that the number of these preclinical subgroups vary from company to company. Data show that 87% of surveyed early-stage product development teams include toxicology in preclinical functions, and an additional 70% include pharmacology. "Preclinical functions often encapsulate multiple subgroups, with each of these key groups supporting a different area of the preclinical space," said Sarah Ray, senior research analyst at Cutting Edge Information. "Life science companies are most likely to include toxicology, lab animal sciences and pharmacology groups, and to a lesser extent, may also include materials science and IT groups." According to the study, much of a company's use of specific subgroups depend on a mixture of team level and company type. For instance, regional teams may rely on toxicology and pharmacology input from global level teams because they may not need as many preclinical subgroups. Alternately, because materials science and biocompatibility groups cater specifically to medical device studies, life science companies without medical devices may not include these groups within their preclinical structures. For more information about R&D structures, resources and workloads, please visit https://cuttingedgeinfo.com/product-category/clinical-development/.